I wore my Pathways pullover to work for the second time today, and managed to grab a quick mirror shot this morning before leaving the house. It’s very wearable as is, but if I had it to do over again, I’d make the neckline narrower. Probably by working 4 more stitches before starting neckline shaping on each side, and leaving 8 stitches on hold at the center neckline. I have narrow shoulders though, so for many people the neckline may be just fine as written. The socks begin ordinarily enough for a toe-up sock: casting on, increases for the toe, some ribbing on the top of the foot, and a short-row heel. But then it gets a little different! Because there’s quite a lot of reverse stockinette between motifs on the leg of the sock, the leg is knit with the sock inside-out, working on the wrong side. Another neat feature is the design on the leg – half of the front and back sports a lace pattern, and there are columns of twisted stitches and bobbles on the other half. The socks mirror each other, so you can wear them with the lace pattern toward the outside of both legs, or toward the inside to show off the twisted-stitch pattern on the outside of the leg instead. 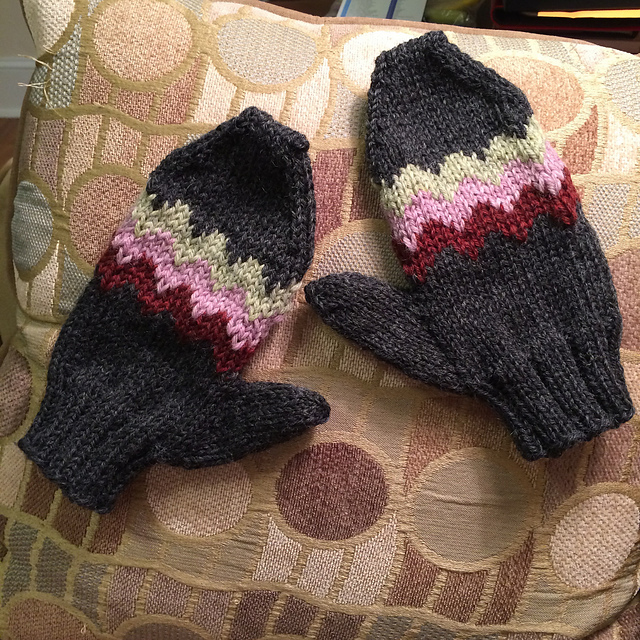 These were really fun to design and knit, and I enjoyed working with a new-to-me yarn. CoBaSi is 55% Cotton, 21% nylon, 16% Bamboo and 8% Silk (check out those boldface letters and you can see where it gets its name). This pattern is now available for purchase on Ravelry! Time off work – even with Mom and Dad visiting – means knitting time. 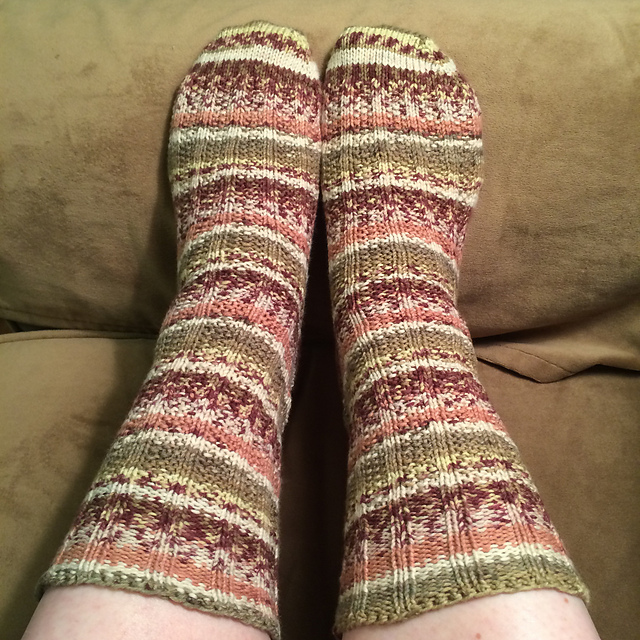 First, I finished up some Seeded Rib Socks I started a couple months ago as car knitting. 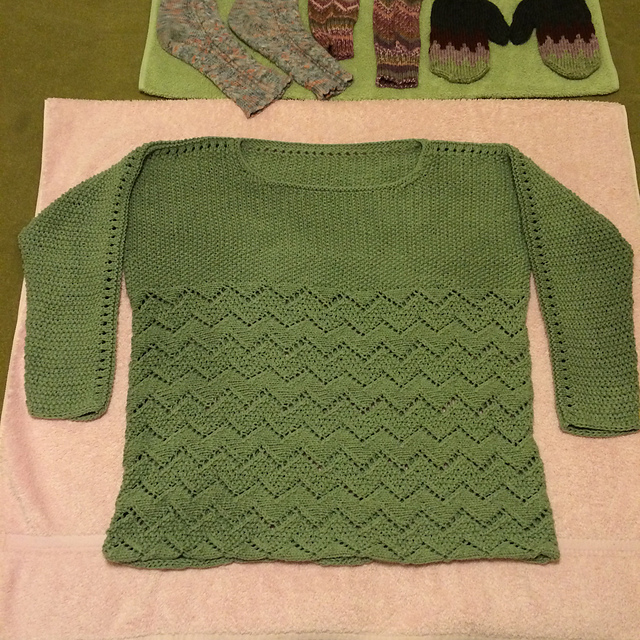 Then, I finished up a sweater I started way back in March. 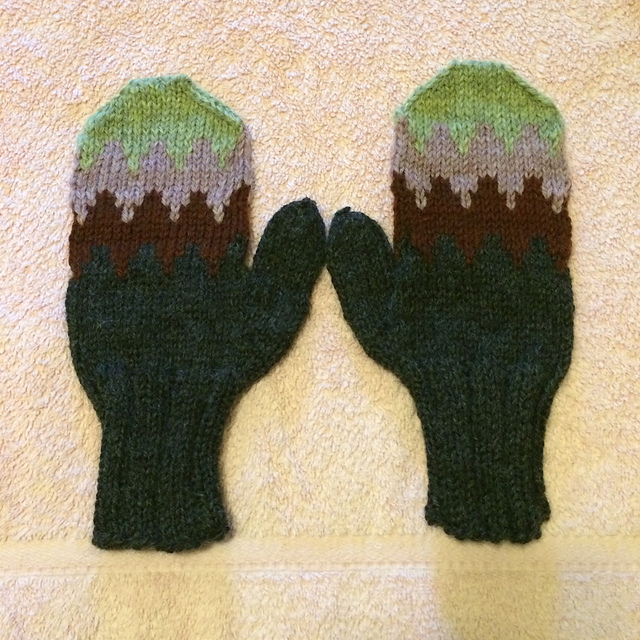 Next came a pair of mittens (my own design, pattern not available), using leftover Galway from my Hiro pullover. There were some things I wanted to change about the mittens, so the first pair went home with Mom and I made myself a second pair. There are more tweaks to be made (and still leftover yarn), so I’ll be knitting yet another pair – and then releasing a pattern for them. And just last night, I started a Koigu Linen-Stitch Scarf (a Churchmouse Classics pattern) – with 450 stitches of mind-numbing linen stitch in each row. But it’s such a beautiful piece, it’s worth wanting to poke myself in the eye with a knitting needle. 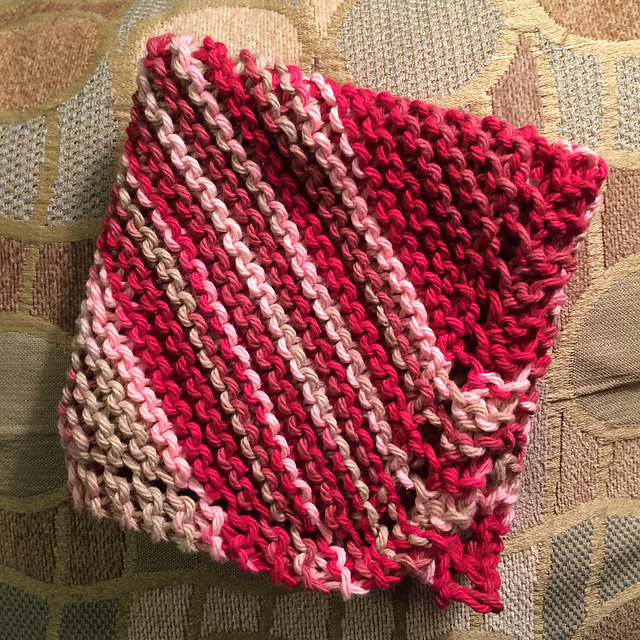 During a weekly FaceTime with Mom recently, she mentioned that her dishcloths (most made by a woman she used to work with) were getting quite worn out and she needed some new ones. So I rounded up a cone and a couple balls of Sugar’n Cream yarn, and got to work. In the past five days, I’ve finished three crochet and two knit dishcloths. And I still have enough yarn left for four or five more. Not quite a plethora, but approaching it. 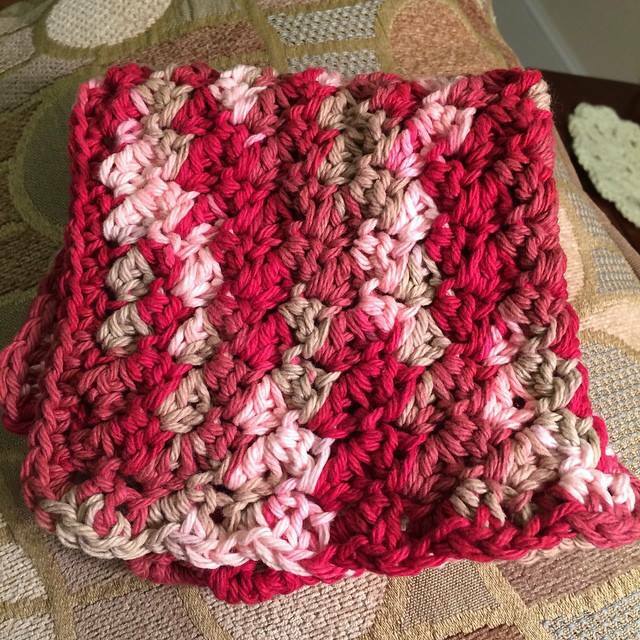 This pattern is Crochet Dishcloth by Little Monkeys Crochet, a free pattern online. It’s extremely easy, and the stitch pattern is versatile for lots of things besides dishcloths. I think it would make a great baby blanket! 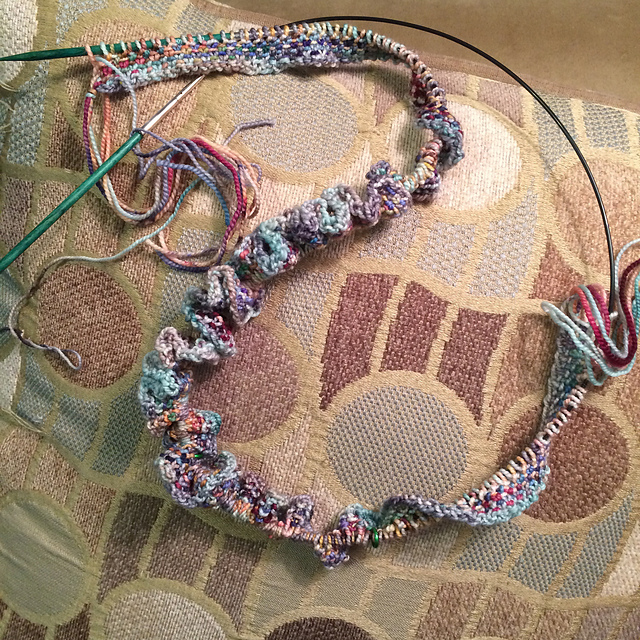 Started with ch 31 for the foundation, which is longer than the pattern specifies. The finished dishcloth used about 56 grams of yarn. I haven’t quite perfected the stitch-to-row ratio for the single crochet edging along the sides – you can see here in the photo the side edge is a bit wavy, while the edging along the top and bottom (left side of photo) is nice and even thanks to the stitch-for-stitch ratio. I used a size I hook, although I’d prefer it a bit looser (but I is the largest hook I have at the moment). I tend to crochet tightly, which is the exact opposite of my knitting tension. 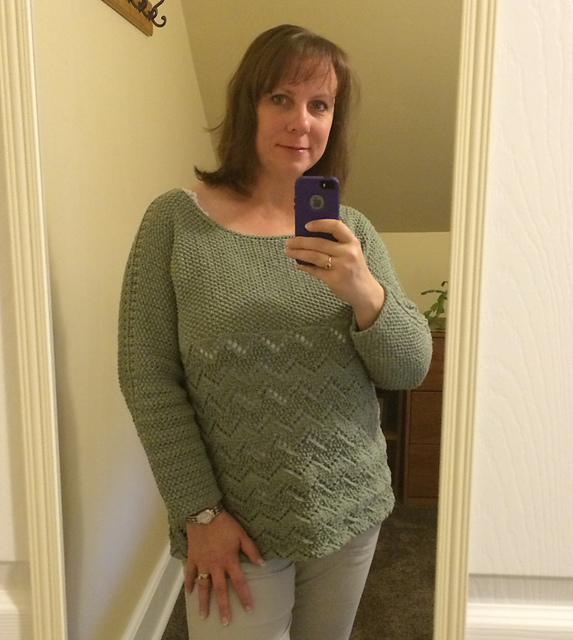 This one is the good old Grandmother’s Favorite, knit on the diagonal. I used a U.S. 8 (5mm) circular needle (because I’ve grown to despise straight needles – I always poke myself, my project, my cat with them). I increased to 54 stitches wide across the center before beginning the decreases. 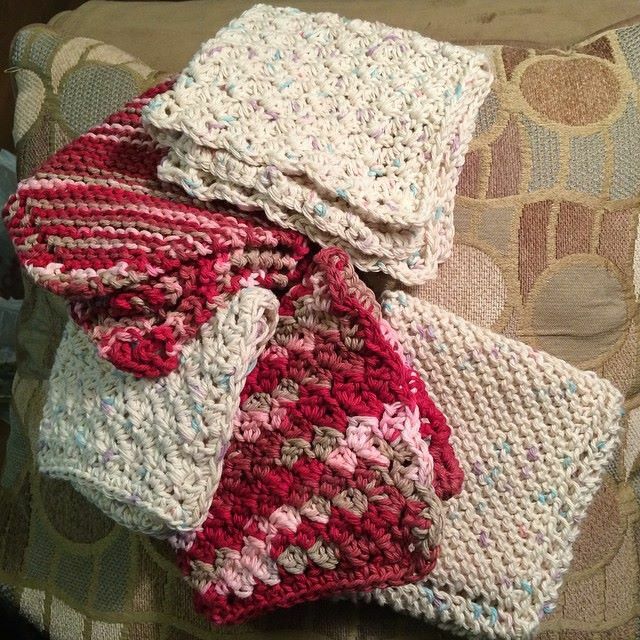 Mom wanted good-sized dishcloths. The finished dishcloth used about 50 grams of yarn. It’s worth noting that the two ombre dishcloths above are the same finished size. The crochet version used six more grams of yarn than the knit version, which is about 11 yards, roughly 12% more than the knit version. So yes, crochet generally does use more yarn than knitting, especially in the denser fabric of the crocheted dishcloth above – but it’s not a huge amount more. I must say, though, I enjoyed the process of making the crocheted one more; it’s an easy stitch and relatively mindless, but a bit more interesting than constant garter stitch.